First prize for good public administration! Together with the city network ANDI (agile network for digital innovation), I won the first prize for good public administration (Verwaltungspreis). 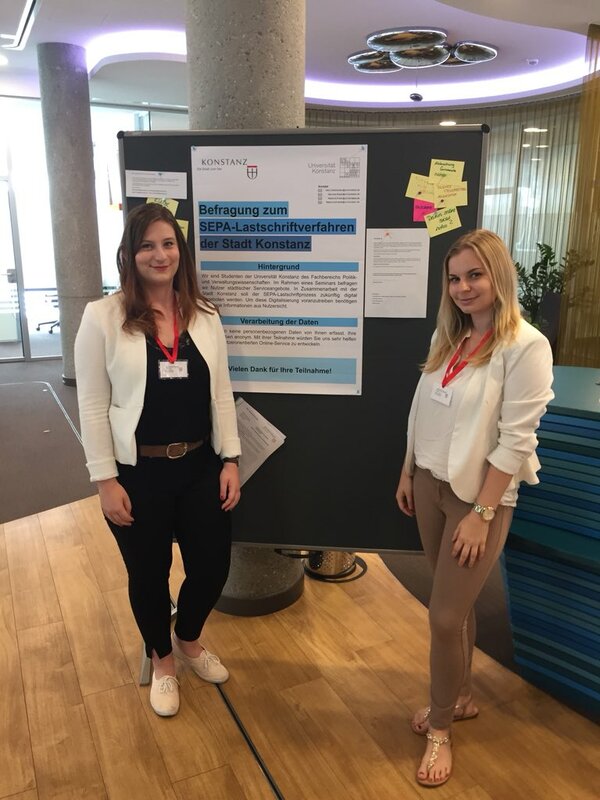 We were selected for our work combining human-centered design in the classroom with real-life digital transformation projects in several cities in southern Germany. The partners include Konstanz, Freiburg, Karlsruhe, and others. Exciting times, when innovative teaching and knowledge transfer concepts are recognized with a prize! I built a platform to quickly share the results of my courses with the public so that public administrators can access the information in plain language: Open Public Administration Scholarship (OPAS). The knowledge for the short memos published here comes from my research-based seminars on the digitisation of the public sector. The students work together with a writing tutor and use an author’s guide developed by me to rewrite their (empirical) learning results in short memos in a generally understandable way. We translate the content into English, and, if possible, link directly to the administrative partners in order to be able to present the direct transfer into administrative practice. This idea is based on discussions at the 2008 Minnowbrook III conference and published in this article in the Journal for Public Administration Research and Theory. I am looking forward to feedback and further suggestions! In your opinion, what does “Digital Leadership” mean? Mergel: Digital leadership has two meanings: It is understood as a particularly outstanding position of an organization or service taking a pioneering role in the field of administrative digitization. This is particularly true of those public administrations, which have done a good job of transforming what used to be an analogue service into a new digital service. These include, for example, the Gov.uk website, Danish e-Invoicing and Estonia’s x-Road data platform. We are now increasingly using the term Digital Leadership to define competencies of public managers. Managers in public administration must act as digital leaders because of their position at the top of an organization or office, otherwise no changes can occur in the subsequent hierarchy. In my view, a digital leader is a public manager who, within the realm of legal possibilities, is able to come up with new approaches to digital transformation together with the members of the organization, and will then enable the team members to implement them with the organization’s overall mission in mind. In buereaucratic and hierarchical organizations, this is only possible with a clear mandate top down – but in the following it is not necessary for the Digital Leader to participate in the design processes – on the contrary! What significance does this type of leadership have for public administration? Mergel: Managers are oftentimes not digital natives because of their seniority in the organization. That is, they did not grow up with laptops, iPads and smartphones and don’t necessarily think processes from a digital first perspective. This means that in public administrations processes and services are designed from the perspective of the mandate, i.e. the law, the directive, or the existing internal logic of the administration. Rarely, however, with the claim to think of a service from the perspective of the user, who would like to do it today above all in a pragmatic approach from their smartphones or at home on the laptop. Due to their often jurisprudential training, public managers are very familiar with the legal framework and have become familiar with its limiting effects in the course of their careers. What are the consequences of these restrictions? Mergel: The implementation of digital projects is often limited to the implementation of laws, but not necessarily to whether the end product is usable by citizens. We have seen many of these non-usable administrative services in recent years – one example is the online function of the new ID card in Germany, which cost hundreds of millions of euros but is used by only a couple percent of citizens. Civil servants often even discourage the activation of the digital apps associated with the ID because the added value is unclear. What specific skills does a digital leader need to bring to public administration? Mergel: A digital leader should create a climate in his organisation that prepares the context for employees in which a digital mindset can be developed. Civil servants have limited room for innovation and are usually only allowed to act on orders with very little room for manoeuvre or experiment. On the one hand, this is an achievement of the rule of law. But on the other hand, it hampers action and, above all, thinking in new dimensions, especially when the mammoth task of digitisation is involved. A digital leader should be able to reconcile all of this with the goals or mission of the organization in mind and defend decisions against high-ranking superiors or politicians. In other words, the role of the digital leader is also to block political attacks or to consciously confront the results of innovative change processes together with the employees. What skills do you train to turn executives into digital leads? Mergel: In my seminars, I mainly focus on what I learned from my international research on digital transformation from the digital service teams in the US, UK, Italy, Denmark, Finland and Estonia. These are teams that are deployed alongside traditional Chief Information Officers (CIOs) to implement digital innovation in public administration. I also use the EU Digital Competency Framework. Why is it so important to train public administration executives to become “digital leaders”? Mergel: Even in the field of digitisation, knowledge is power! Managers have to rely on glossy brochures and promises from external consultants due to diminished competencies in the IT departments and the long-lasting e-government investment backlog. As a result, they are often chased from one innovation hype to the next and ultimately they no longer know what to focus on: Do we need Blockchain for registration certificates? How many jobs are lost when artificial intelligence makes human decisions obsolete? What digital skills need to be developed? The subject of digitisation has become a fearful issue among employees and led to an immense dependence on external service providers has arisen, both in terms of content and technology. I advocate that both organizational and technical innovation processes must be triggered primarily through conscious internal change efforts. In public administrations, managers should be the drivers of innovation that enable their employees to think about innovations for citizens first, regardless of the legal framework. The second step is to check the legal foundations. Only then can the budgets be changed together with city councils or the end products be implemented by external IT service providers. What do you give executives on the way to transforming the corporate culture in their agencies in the face of digital change? When I hear statements like “We’ve always done it this way” or “We’re not allowed to do it that way” – I like to reply with the request to show me the law or the guideline which says that exactly this procedure or these tools are forbidden. These are killer phrases that undermine any innovation – be it of an organisational or technical nature – and prevent renewal. Don’t be scared – be bold! Especially when it comes to digitisation, there will always be experts who are far superior to you. Put aside the thought that as a manager you must always have all the knowledge you need. If a service provider or one of your team members with a lot of technical know-how can’t teach you how a tool or a process works, then others will have the same problem. So be persistent and let it be explained to you until it is clear. But also be aware that there are digital leaders in your own organization who are hierarchically subordinate to you, but who have more product and process knowledge in this area. This quickly makes it clear that digitalization is far less about the technical competencies of managers than about organizational and cultural change competencies, and that managers have to be inspired by them. Create experimental spaces to understand digital! Only those who become part of it and try it out can make good decisions. Paper is patient, but experimenting – hands-on – with new technologies opens up the possibilities that digitalisation brings with it. Remember that both your organisational members and citizens are facing change with big eyes and need to build competences. Take the steps together. Only if you understand how digitisation works and have tried it out can you guide citizens to use the new tools, especially empower your own staff to experiment with them. A good example of this change is the city of Ulm’s Verschwörhaus. Break down organizational persistence and inertia! Many civil servants have seen administrative reforms come and go – they have mostly seen them fail. And that is exactly where you need to start: Encourage change by giving employees room to participate in events organised by internal innovation laboratories, invite exciting speakers to workshops in which people will learn from new perspectives and skills. This is much less about “shock and awe” lectures, such as a trip to Estonia, which leaves staff more frightened of the things to come. Make it about pragmatic lectures and workshops that impart skills, such as a Design Thinking workshops in which a chatbot is created or an administrative process is rethought. Allow the implementation and application of what you have learned. Only those who exemplify digital leadership, incorporate it into traditional action formats and allow their implementation into standard operating process will be able to play an active role in the coming years and not be surprised by every fad, but be able to actively shape their own digital transformation! In November 2018, I was elected as a fellow to the National Academy of Public Administration. The Public Administration researcher Prof. Dr. Ines Mergel from Konstanz was elected to the class of Academy Fellows 2018 by the U.S. National Academy of Public Administration (NAPA). This is in recognition of her many years of research in the field of public administration. The 40 new Fellows will be introduced during the Academy’s annual fall meeting, which will take place in Washington, D.C., from November 1 to 2, 2018. Ines Mergel, who is only the second German member of the NAPA Fellowship, has been Professor of Public Administration at the Department of Politics and Public Administration at the University of Konstanz since 2016. In 2002 she went to the Harvard Kennedy School of Government in the USA, in 2008 she was appointed Assistant Professor with Tenure Track at the Maxwell School of Citizenship and Public Affairs in Syracuse. With the presidency of Barack Obama, who used social networks in his election campaign, she began researching the use of new technologies in U.S. federal agencies. Ines Mergel’s academic influence on public sector innovation, social media and digital service practices, her sense of collaboration and her commitment to improving governance in the U.S. and around the world make her an ideal candidate for election as a NAPA Fellow, the nominating letter said. The administrative scientist was invited as an expert to the Bundestag committee “Digital Agenda” in 2017. She advises the Estonian government as well as the city of Constance on the digitisation of its official services. The National Academy of Public Administration is a non-profit, non-partisan organization that focuses on the analysis of new trends in government and administrative action. The selection of NAPA Fellows is based on a rigorous review of each candidate’s contributions in the field of public administration and politics. In total, there are approximately 900 Academy Fellows, including former cabinet members, congressmen, governors, mayors, state legislators, renowned academics, business people, nonprofit leaders, and public administration members. The administrative scientist Prof. Dr. Ines Mergel from Constance is accepted into the class of Academy Fellows 2018 of the National Academy of Public Administration (NAPA). Non-profit and non-partisan NAPA analyses new trends in government and administrative action in the USA. Rainer Kattel and I have written a paper that will be contributed to an edited book sometime next year about policy success stories. We have decided to publish a pre-print version to get the word out early. Our paper titled “Estonia’s digital transformation: Mission mystique and the hiding hand”. In 2017, The New Yorker published an article titled ‘Estonia, the digital republic’ and subtitled, ‘Its government is virtual, borderless, blockchained and secure. Has this tiny post-Soviet nation found the way of the future?’. This summarises the buzz around Estonia’s digital government: from the outside, at least, it is seen as a major success and has been lauded in mainstream media such as the Financial Times, New York Times and Forbes. Given this success, it is somewhat surprising that this narrative, and its main drivers, has not been actually properly documented in academic research. In our new working paper, we do exactly that using interviews with all key architects of Estonia’s digital government. What were the main drivers behind its digital transformation? And perhaps most importantly, what does Estonia’s digital transformation tell us about the future of (digital) governance? The Estonian e-government infrastructure and its success rest on two main pillars, both introduced in 2001, which essentially create digital access to state and digital citizens: the data infrastructure x-road and a compulsory national digital ID. X-road is an interoperability platform for existing decentralised databases and a data exchange layer that can be used by public and private sector actors. It is independent of platforms and architectures and provides secure interoperability for data exchanges and identification of trusted actors in digital service delivery. The digital ID makes it possible for citizens to be identified digitally and to use digital signatures. Together, x-road and the digital ID make it possible to digitally sign any contract, access essentially any public service, order prescriptions, file taxes, vote and so forth. More than 2,300 public and private services use x-road, and the digital signature has been used almost 350 million times by Estonia’s population of 1.3 million. The digital ID penetration is close to 100%; 30% of votes are cast digitally (in both local and national elections); almost all personal income tax declarations and medical prescriptions are done online, and most medical records held by hospital and family doctors are accessible online. The Estonian government claims that its digital infrastructure has led to annual savings of about 2% of GDP and more than 800 years in working time for the public and private sectors. According to the EU’s Digital Economy and Society Index (DESI), in 2017 Estonia was the leading nation in Europe in digital public services, although in 2018 it dropped to second place. However, in most other e-government rankings Estonia‘s digital success is less evident. In DESI’s overall ranking, Estonia is in ninth position for 2018 and, according to the UN’s 2018 e-government survey, it is ranked only 16th globally. This cognitive dissonance — high praise and leadership position in global news outlets versus relatively middling rankings in overall digital transformation indexes (for more discussion, see Drechsler’s contribution in this new book) — reflects the nature of Estonia’s digital success: Estonia is ranked high for its digital public service infrastructure, which is universally available and mandatory, and an integral backbone of public service delivery. Estonia’s digital success, however, is not about other digital offerings such as digital democracy, citizen engagement or digitally transforming public services such as the welfare state. The specific nature of Estonia’s digital achievement and at the same time disconnect between technological infrastructure and degree of digital penetration is often overlooked in international coverage. As Estonia’s digital government came to be focused on the x-road, Estonia has effectively created its own legacy system — a move that the initial thinkers wanted to avoid. Indeed, in the early 1990s, the focus was as much on secure digital infrastructure as it was on advancing societal goals through digital means. Yet, in particular throughout the 2000s as Estonia blazed through an economic boom that created increasing inequalities in its wake, the evolution of digital government seems to stalled. While many digital services have brought efficiency gains to citizens and businesses in Estonia, citizen satisfaction with crucial services such as healthcare and education has remained low. As an example, according to OECD rankings in 2014, Estonia ranked fifth from bottom in satisfaction with health services (in 2007 it listed the lowest) and second from bottom in education system satisfaction (in 2007 it ranked third lowest). Further, Estonia performs poorly on some critical social indicators. For example, in 2016 it had the highest gender pay gap in Europe and a higher than EU average Gini index. While citizen satisfaction is not the only measure of the quality of public services — and digital infrastructure is only one component in the provision of sophisticated services such as health and education — it is indicative that there is a little-measured improvement in the provision of core public services. How did the success come about? Perhaps most surprisingly, Estonia has never had a central office for digital transformation, such as the UK’s Government Digital Service (GDS), even though such a central agency was initially envisioned to manage (among other things) vital public registries. Estonia’s digital transformation has been an extended and on-going process over three decades, starting in the early 1990s, when Estonia regained its independence and continuing to the present day. Much of this process has been ad hoc and informal. For example, many strategic policy documents for digital transformation have followed the rhythms of European (structural) funding periods rather than responding to domestic challenges and planning processes. Similarly, various overlapping and mostly self-managed public-private networks have provided the informal dynamic capacity and capability for change, few of which have been institutionalised or formalised. And above all, the process relied initially on what Albert Hirschman has called the principle of the hiding hand: policymakers push visionary changes without anticipating all the challenges and risks involved upfront, an approach that sometimes results in unexpected learning, creativity and — in this case — success. The naiveté and enthusiasm of the hiding hand that propelled the initial ‘crazy ideas’ of the early 1990s became ingrained in Estonia’s digital policymaking culture. As Mart Laar, prime minister in 1992–1994, and 1999–2002, and perhaps the key politician in this story, once said: “I was 32, I was young and crazy, so I didn’t know what was possible and what’s not, so I did impossible things.” (As he told us, for him the e-residency programme is simply not crazy enough.) Estonian digital government came to rely heavily on such charisma and hacker mentality. The hiding hand was propelled by another rather simple phenomenon: envy. The success of Finland and Nokia became one of the guiding political reference points in the 1990s: ‘What is our Nokia?’ asked Lennart Meri, Estonia’s first president after Estonia regained independence in 1991, a question that has remained a popular catchphrase. Importantly, the confluence of Soviet industrialisation with ethnic tensions (mass immigration in post WWII era was related to rapid industrialisation during this period) explains why Estonia, despite being one of the most economically and technologically advanced countries within the Soviet Union, chose not to upgrade the inherited economy and instead sought to do something completely different. As an emerging general-purpose technology, ICT offered an almost perfect solution, particularly given the availability of R&D skills in this sector. ‘The digital’ thus came to express Estonia’s — or more precisely, its elite’s — ambitions and explains why, to this day, the ‘digital elite’, with some rare exceptions, is almost all ethnically Estonian. While the Soviet legacy had left Estonia with an outdated industrial structure and widespread aversion to industrialisation, it also left Estonia with a wealth of R&D talent in ICT through various Academy of Sciences institutes, such as the Institute of Cybernetics (established in 1960, its spin-off Cybernetica AS developed x-road and e-ID) and other similarly highly advanced academic institutions. As their funding collapsed in the early 1990s, much talent poured into emerging private companies, in particular, various joint ventures with Scandinavian telecoms and other companies. Estonia has geographical proximity to Scandinavia, and in the 1990s the Nordic countries had one of the fastest developing telecommunications sectors globally. Opening up both policy-making processes (through advice and joint ventures) and markets (through privatisation and regulations) to Scandinavian partners brought know-how and investment. Estonia is a small country with a high population concentration in its capital city: almost one-third of its 1.3 million inhabitants live in Tallinn. This clustering of population facilitated agile networks that were able to gain quick and lasting political support, and which required low initial infrastructure investment. decentralised digital agendas (including databases) of line ministries and agencies. Silicon Valley of digital government? Estonia’s focus on ICT as general-purpose technology has proved to be one of the critical success factors as it enabled Estonia to create a digital infrastructure that is universal in nature. Yet by relying on decentralised and mostly informal networks to build this infrastructure, Estonia now faces a challenge to develop capacities and capabilities within the public sector to take advantage of the public digital infrastructure. Thus, perhaps the most significant question faced by Estonian digital government is whether the main reasons for its success — particularly its charismatic leadership-based informal networks and civic hacker culture — provide enough capacity to harness the potential of Estonia’s digital infrastructure for more inclusive public services and society. While the decentralised digital agendas of line ministries have provided needed agility, they have also created uneven digital capabilities across different departments and agencies. This reliance on bottom-up departmental initiatives seems to necessitate stronger and perhaps more formalised coordination structures than are currently present. Furthermore, while e-voting is increasingly popular, other aspects of digital democracy, such as civic engagement, have remained weak (with the notable exception of the so-called Citizen Assembly of 2012–2014, which, however, failed to deliver any significant results). Economic efficiency gains are not enough as value frameworks for digital transformation. Digital agendas should be more comprehensive in focus and combine social justice and other pressing socio-political issues with economic efficiency. While digital infrastructure — from data registries to identification and payment systems — are sine qua non for digital governments, so are institutional innovations that would create, as John K Galbraith put it, “countervailing powers” to existing powers and routines within the bureaucracy and but also in the broader political landscape. Such examples would be public ownership option of private data. Public sector organisations need new forms of capabilities that centre on socially conscious design and software skills in order to harness the power digital technologies for greater common good. Estonia is indeed in many ways Silicon Valley of digital government, in the good and in the bad. Its success is based highly decentralised and agile actors that are goal-focused but also with little regard to social outcomes. Much has been written about how governments are creating open data platforms and are sharing data with the public. Most of these platforms are designed for the reuse by professionals, such as journalists or researchers. Beyond visits to an open data portal it is however difficult to trace how data is actually used and if it pays out for public administrations to invest in open data efforts. Similar to innovation, open data is assumed to be positive: it must lead to increased transparency and accountability – simply because of its existence. In this paper, we used qualitative interviews with 15 U.S. cities that have created an open data portal and have an explicit open data strategy. We interviewed public managers responsible for open data in order to understand their perceptions of the outcomes of their open data activities. As a result, we were able to trace both product innovations (apps, websites, etc.) and process innovations that are mostly internal to government. The article is available online in open access format here. Mergel, I., Kleibrink, A., & Sörvik, J. (2018). Open data outcomes: US cities between product and process innovation. Government Information Quarterly. Designing public services has become an important issue in the public sector: In countries like Germany, the number of interactions with public administrations seems to be insignificantly low: only about 1,7 or 2,7 times per year, citizens have the need to interact with their local governments. As a result, there doesn’t seem to be a lot of calls for change in the way that services are delivered. Citizens even claim that they trust a paper proof more than an online interaction with government. After all, they have the proof in their hands that they have submitted their files, claims, or paid their dues. As soon as we start to talk to citizens however, it becomes clear that they are experiencing an extreme media break between their private interactions online, such as online shopping, social networking, etc., and their professional interactions with public administration. There doesn’t seem to be a reason, why they are downloading a form from a government website, print it out at home, fill it in by hand, walk it to a government office, and then watch a frontline worker type in the form electronically. We also know that computer programs have far advanced in recent years that they are much better in recognizing faces in comparison to human beings, and that files are indeed electronically safer than the one paper copy that is stored in a binder in a physical government office. This is where one of my latest seminars has started: How can we design public services that citizens actually want to use and trust? 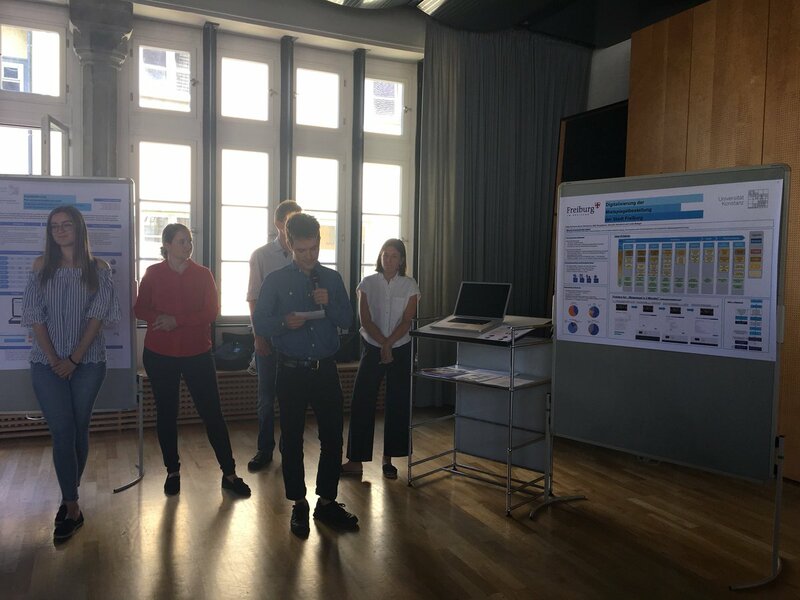 I have designed the seminar using human-centered design approaches and teamed up with four cities in southern Germany who were working on standardizing 40 of their public services. We chose the top four processes for the class. 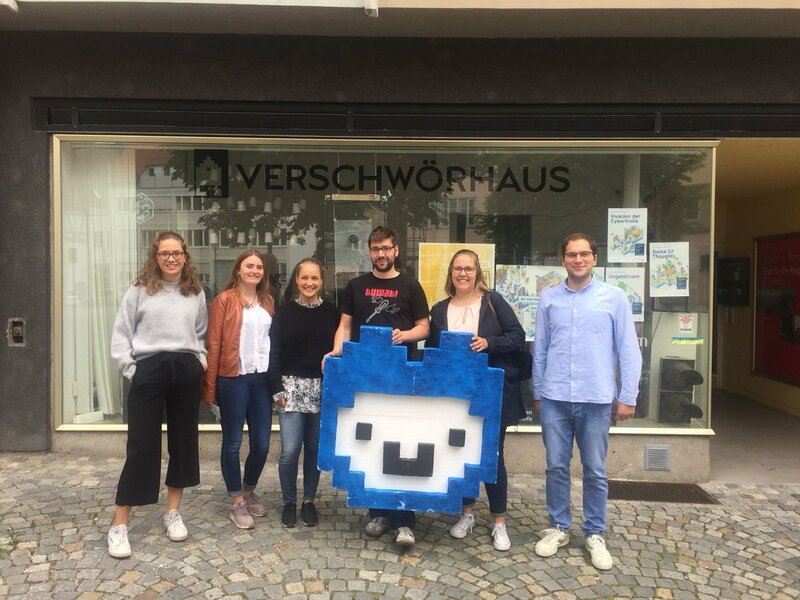 The cities of Konstanz, Ulm, Freiburg, and Friedrichshafen collaborated with my students and I worked on supporting the students’ trips with funding from the University of Konstanz’ Transfer project. The students learned how to conduct user interviews. During this period, I teamed up with Martin Jordan, Head of Service Design, at the UK Cabinet Office’s Government Digital Service Team. The students learned that users are internal users (public servants who supply the service) and external users (citizens or companies). In a first step, they interviewed product owners to gain insights on how the process was designed, what happens with the data. They derived process characteristics and a flowchart of the data flow. Next, they went out to interview users (citizens in each city) and derived a user journey. They found stories that go far beyond the mere application process and tried to get holistic insights about the process as well as exchanges and dependencies with other departments. And finally the kicker: The students came up with prototypes for each process. The student teams, triangulated the different types of data they collected and synthesized their findings into a new version of the process. Some of them designed a prototype with scissors and paper, others built mocks-up using Powerpoint, and one team actually created a website. Did I mention that they are Bachelor students in public administration? They are not programmers, but they came up with insights that every IT service provider can now use to implement the revised process. What was the impact of this seminar? Proud students, who now know that they are well-equipped for their BA thesis (no small feat). Seemingly happy cooperation partners: Two of the processes were already selected to be implemented including the suggestions of the students. I call this a major success: there is usually no transfer or immediate implementation of student projects. Given the direct implementation of the students’ suggestions: They are making an impact on all citizens in this state. Smaller groups, or more intensive training in team building and conflict management skills. Help the students understand how they can become teams – fast – and how they can make decisions as a team. Find external funding – don’t bother with internal funding and all that it entails (settlement of accounts, etc.). Lobby hard enough so that cities understand the value of providing funds for travel costs – or: stay local. Overall, it was very much worth it! We have a 50% position available in my research group on digital transformation. The work is related to our EU Co-VAL grant. The work area is on digital transformation and living/innovation labs. The full job ad can be found here. Since 2007, the University of Constance has been successful in the Excellence Initiative of the German federal and state governments. for a period of 2 years. Research collaboration in the EU Horizon 2020 project “Co-VAL: Understanding Value Co-Creation in Public Services for Transforming European Public Administrations” in the research area of the chair “Public Administration”, collaboration in the working package “Digital transformation of public administrations” and “Living Labs” with the following subtasks: Policy and process tracing, international comparative public management case research and ethnography of a selected case. The prerequisite is an academic degree with an excellent master’s degree or doctorate in public management or information sciences, ideally with an administrative background and the willingness and willingness to work independently at the Constance site. The university strives to eliminate disadvantages that exist for female academics in the field of higher education. It aims to increase the proportion of women in research and teaching. The University of Constance is particularly committed to reconciling family and working life. People with a severe disability are given priority if they are suitable (telephone number of the representative for the severely disabled: +49 7531 / 88 – 4016). The University of Constance supports dual career couples. 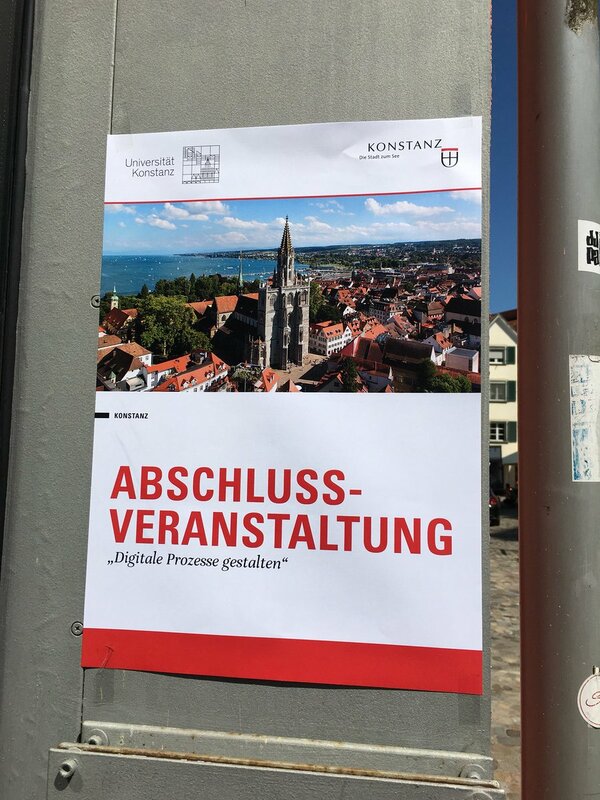 You can obtain information at: http://www.uni-konstanz.de/dcc . Please send your application with the usual documents to Prof. Dr. Mergel, Department of Political and Administrative Science, University of Konstanz, 78457 Konstanz (ines.mergel@uni-konstanz.de) by October 31, 2018, stating the reference number 2018/120. Please don’t hesitate to ask me anything about the positions!